In this article, we assess the best cameras from the leading manufacturers to give recommendations on the best cameras for astrophotography in 2019. As part of this website’s astrophotography masters series, we have asked some of the world’s best night sky photographers what cameras they use and their recommendations are included here. The camera models below are all technologically up-to-date in 2019 and popular amongst astrophotography enthusiasts, both amateur and professional. 4.1 What should I look for in a camera for astrophotography? 4.2 Can I use a normal DSLR or mirrorless camera for astrophotography? 4.3 What are APS-C and full-frame sensors and what is best for astrophotography? 4.4 Are there specialist astrophotography cameras? 4.5 Do I need a specialist astrophotography camera? 4.6 Can I convert a regular camera to be a specialist astrophotography camera? 4.7 What is a DSLR camera? 4.8 What is a mirrorless digital camera? 4.9 What is best: DSLR vs mirrorless cameras? 5. Overall – What is the best camera for astrophotography? 5.1 Vote – what do you think is the best astrophotography camera? You don’t necessarily need an absolute top-end camera to take great pictures of the night sky. In fact, many budget and mid-range models will provide all you need in the way of performance for landscape astrophotography – that is capturing the milky way and the stars over the Earth. The below cameras are some of the newest models from the most reliable brands that will provide what you need in a camera for night sky photography, and all other types of photography, but at a relatively lower cost. They all have APS-C sensors, which will underperform in comparison to full-frame cameras, but are much more affordable (see the advanced cameras further below for those with full-frame sensors). We have recommended here three cameras that provide some of the best value in 2019 and would suit beginners looking for a first DSLR camera, or just someone looking for a 2019 upgrade. They are not specialist astrophotography cameras, but rather great all-round performers that are more than capable of delivering this area. The Pentax K-70 is a great DSLR that is suitable for beginners and more experienced users alike. It has a tilting night-vision screen and is weather-sealed so you don’t need to worry about it getting wet in the rain. It was first released on to the market in summer 2016 and provides great value for money. It’s a 24 megapixel, APS-C sensor camera with an ISO range of 100-204800. 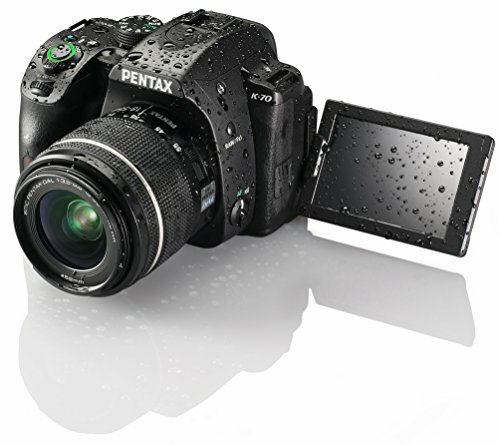 Find out more about the K-70 on Pentax’s site. The D5600 is fantastic entry-level / mid-range DSLR from one of the most popular camera manufacturers out there. Released 2017, it is the next model up from the popular Nikon D3500 model. Photographer Marcus Cote uses the earlier version of this camera (the D3200) for astrophotography. It’s lightweight, has a 24mp APS-C ensor with an ISO of 100-25600. Find out more about the D5600 on Nikon’s site. 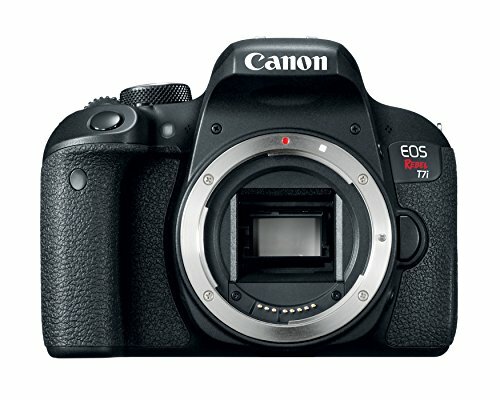 Canon’s EOS Rebel T7i was released only around a year ago in early 2017 and is one of the best beginner DSLR cameras available. It has a 24 megapixel CMOS (APS-C) sensor with an ISO range of 100-25600. Find out more about the EOS Rebel T7i on Canon’s site. The below three cameras are the top of the line DSLRs for astrophotography in 2019. These are all full-frame sensor cameras, which generally have better noise performance in night photography than APS-C sensor cameras. The first two – the Canon EOD 5D Mark IV and the Nikon D850 – are possibly the two leading all round DSLRs for all types of photography currently on the market. 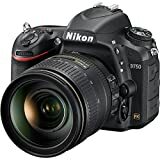 The third – the Nikon D810A is a specialist astrophotography DSLR camera that is optimized for deep sky astrophotography and bringing out the colors in photos of far-off galaxies and nebulae. 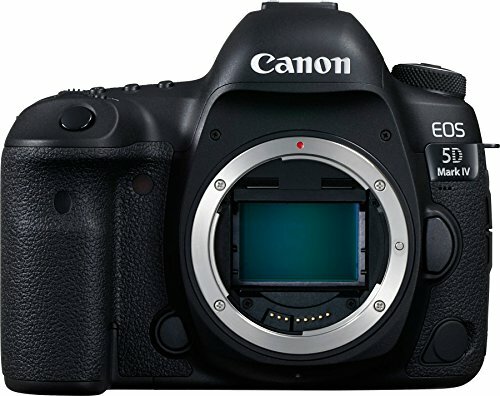 The Canon EOS 5D Mark IV was released in the second half of 2016 and is a great camera with outstanding low-light capabilities. It is one of the best DSLR cameras for astrophotography and potentially the best Canon astrophotography camera. From the Skies & Scopes astrophotography masters interview series, Ivan Slade and Leonardo Orazi both use the older predecessor to this camera (the Canon 6D). Sensor: A 30.4 megapixel full-frame high-speed CMOS sensor means it performs well for shooting the night skies. ISO: It has a high ISO range of 100–32000 (expandable up to 50–102400) and features one of the best CMOS sensors for shooting photos at night. Noise: The EOS 5D Mark IV has powerful built-in features for noise reduction and delivers some of the best results in tests of various cameras’ abilities to suppress noise. The high resolution of approximately 30.4MP brings out the variation in brightness of the stars. Because noise is basically pixel-based, the more pixels there are, the smaller the pixels, and therefore the less they stand out. Moreover, because dark stars will appear smaller, the variations in the brightness of the stars are brought out. Weight: It’s marginally lighter than the Nikon D810A at 800 grams (28.22 oz), although heavier than the Sony A7Rii covered below. Touchscreen: A great feature for night shooting as it helps your reviewing your picture in the dark. Usability: A relatively small thing, but the remote control terminal has been placed in the front of the camera which makes it much easier to use in the dark. Ergonomics: It can be awkward using the touchscreen because your right-hand grips the camera you need to loosen that to pinch zoom in/out. Find more detail on the EOS 5D Mark IV on Canon’s site. Canon did previously offer specialized models for astrophotography (for example, the Canon 60 DA) but this practice has been discontinued in favor of focusing on high-performance DSLRs that can deliver in multiple areas. The Canon EOS 5D Mark IV is a great example of this done successfully. This is a brilliant all-round camera and many astrophotographers generally believe that Canon outperforms Nikon in this area, so don’t be put off but not being able to find a specialist Canon model for astrophotography. 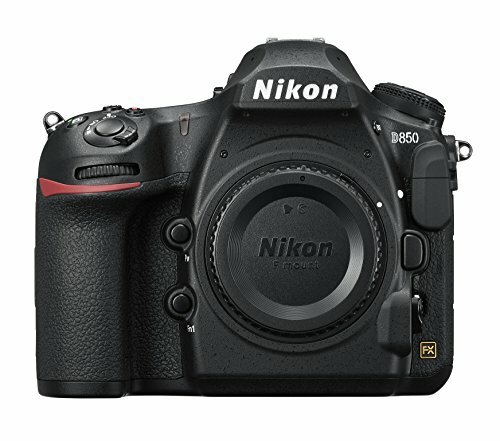 The Nikon D850 is widely regarded as one of the two best new cameras of 2017 (with the Sony A7RIII being the other one – see below) and is being referred to as ‘the last great DSLR’ camera. It’s Nikon’s newest and most advanced model and is gaining popularity amongst users as a fantastic camera. It is not a specialist astrophotography camera but it is a brilliant all-round DSLR that can deliver in this area. Sensor: At 45.7 megapixel it provides outstanding resolution. Screen: It has a tilting touchscreen, which is greatly appreciated when photographing the night sky – as are the illuminated buttons. ISO: Extremely high at 64-25600 (expanding to 32-102400). Video: Capable of 4K Ultra HD video recording. Weight: At 2.02 lbs it is heavier than the Sony A7RIII. Cost: As with all the top-end cameras on this list, it requires a reasonable investment and so would only be for those with sufficient budgets. Find out more about the D850 on Nikon’s site. The Nikon D850 makes the perfect choice for someone looking for the most up-to-date and technologically advanced DSLR camera that be used for all photography – this is where it contrasts with the Nikon D810A, which is a specialist astrophotography model. The D850 is ideal for someone looking for a market-leading camera that can also be used for all kinds of photography. It’s definitely a camera that can take pictures of the stars, but it also excels for portrait, landscape or whatever else you want to shoot. The highly respected Expert Imaging and Sound Association (EISA) awards for 2018/19 named the Nikon D850 the ‘best professional DSLR camera’. An alternative to the D850 is the slightly lower spec Nikon D750. This camera makes a great option if your budget is lower but you still want a top of the range Nikon. This is also a camera that is popular with astrophotographers. Mirrorless cameras offer similar performance to the advanced DSLRs but in more lightweight cameras. The difference used to be that for the same price, you would get a much better DSLR than you would a mirrorless, but in 2019 the technology has advanced and prices have come down to make mirrorless cameras serious competitors to DSLRs for astrophotography and all photography. 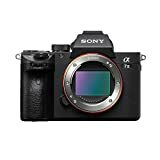 The Sony A7RIII is a high-resolution full-frame mirrorless camera it can seriously compete with the best DSLRs for astrophotography and as an all-purpose camera. In fact, it is widely regarded as one of the top two all-round cameras on the market now – with the Nikon D850 being its primary rival. ISO: High ISO of 100-32000 (expandable to 50-102400) with excellent noise performance. Sensor: 42.4 MP back-illuminated Exmor R CMOS image sensor results in stunning image quality with high levels of detail. Lenses: Any lens of just about any brand can be used with the camera (with the use of an additional adapter). Screen: Unlike the models featured above it has a tilting screen – yay! Weight: At 1.45 lbs it is significantly lighter than the Nikon and Canon models featured here and feels less clunky to carry. Battery life: In a significant improvement from the previous model (the A7RII), the battery life is no longer a weak point and it now can be expected to last as long as a comparable Nikon or Canon model. The “star eater” issue: A Sony firmware update for the camera in early 2017 resulted in a loss of performance when shooting the night sky – with stars disappearing as they are under 1 pixel in the image and therefore mistaken by the camera as ‘hot pixels’ and deleted – this has become known as the “star eater” issue. However, as of 2018, the problem has been resolved. Menu system: It’s not the most intuitive and can take a long time to get set up to shoot as you want it to. Screen: Lacks full touchscreen functionality. Lenses: Whilst you can adapt Nikon or Canon lenses to work in this camera they will lose performance as a lens always works best on its own brand of camera. Therefore the Sony Zeiss lenses work best for this camera but this limits your options. Sony also offers the confusingly-similar named model, the Sony A7 III, which was released in 2018. The A7III is a slightly lower-spec model to the A7RIII, in particular, the a7R III allows the capture of higher-resolution images at 42 megapixels, compared to 24 megapixels for the A7III. However, the A7III is offered at a correspondingly lower price and some photographers even believe that it performs slightly better in low light than the A7RIII. Interestingly, the 2018/19 EISA awards named the Sony A7RIII as the ‘best professional mirrorless camera’, and the Sony A7III overall ‘camera of the year’. Overall, if you think you higher resolution images for your astrophotography then the a7R III is a slightly better camera, but this is – of course – what you pay extra for, and the A7III is an amazing mirrorless camera. Find more detail on the A7 RIII and the A7 III on Sony’s site. The Sony A7RIII is a great camera and makes sharp, high-resolution images and will deliver for astrophotography. It’s incredibly popular with its owners. Many photographers do prefer DSLRs and you should be aware of the differences when considering investing in this camera, but it is a great all-round model. As noted, this camera (released in 2017) is widely-regarded as one of the best available all-round cameras on the market – and that’s not just mirrorless cameras, all cameras including DSLRs. Previously, the “star eater” issue caused by a firmware update was a problem for astrophotographers, but this has been resolved as of 2018. The Fujifilm X-T20 is a great mid-range mirrorless camera for astrophotography in 2019. Not in the same league as the Sony models above, but the price matches accordingly and so can make a great first mirrorless camera if that is what you are looking for. Brand new on the market last year (2017), it’s extremely popular with users. It has a 24MP APS-C sensor with an ISO range of 200-12800 and a tilting touchscreen. 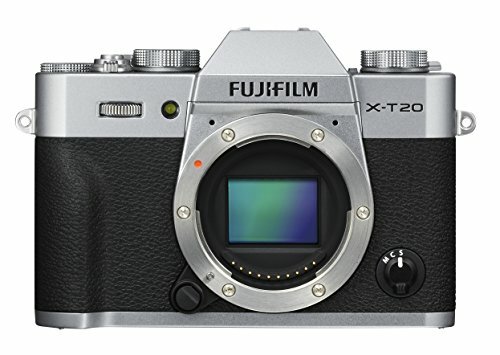 Find out more about the X-T20 on Fujifilm’s site. What kind of pictures do you want to take? I.e. starry skies, the Milky Way and the planets, vs deep sky imaging (far-off galaxies and nebula). How seriously are you going to use the camera? I.e. just for occasional fun, vs a regular and serious hobby, vs a professional money-making venture. How much is your budget? Cameras can range from a few hundred dollars to a few thousand. It’s best to decide how much you want to spend on it and find the best model within that range. If you want to mostly take pictures of starry landscapes, then a standard DSLR or mirrorless will likely be best for you. Similarly, if this is something you want to do as a hobby, then would make sense to get a good all-round camera as you can use it for all your photography. If you are serious about getting into deep sky photography, then a specialist (or converted) astrophotography camera might be what you need. Modern, standard DSLR and mirrorless cameras are highly capable of performing excellent astrophotography imaging. However, they aren’t perfect as they have a filter that reduces the amount of infrared light that enters the image sensor. This reduces their performance for deep sky imaging – i.e. photographing far-off objects like galaxies and nebulae. The filter is there to improve the performance of the camera in regular daytime photography, but it filters out hydrogen-alpha (h-alpha) infrared light which many deep-sky objects emit and so limits the capability to photograph these. Full-frame cameras typically have better noise performance than in APS-C cameras. This is important in astrophotography as it allows the photographer to use a higher ISO setting in order to collect more light and take better night pictures. This is due to the fact that a full frame sensor is larger and can collect more light in the same period of time in comparison to an APS-C sensor camera. This works to reducing noise (a type of distortion on images) and means that the camera detects more stars and achieves better astronomy images. The downside is that full-frame cameras are more expensive than APS-C or other sensor cameras. Yes, the Nikon D810A and the Canon 60Da are both specialist DSLR cameras optimized for astrophotography. They feature an infrared-blocking filter to let in more h-alpha light than the standard model and thereby better to perform deep sky imaging. The Nikon D810A was released in 2015 and was a tweaked version of the Nikon D810. The Canon 60Da was released in 2012. It was a tweaked version of the regular Canon 60D DSLR but optimized for astrophotography. Canon had previously offered an astrophotography DSLR in the Canon 20Da, which was released in 2005. Read here for our overview of these cameras and whether specialist astrophotography DSLRs are a thing of the past – the death of the Nikon D810A (and the specialist astrophotography DSLR?). All of these cameras are currently discontinued and so the only way to get hold of them is second-hand. Try KEH cameras, who specialize in pre-owned photography equipment. It is only the very experienced astrophotographer that will need – and be able to make the most of – a specialist astrophotography camera. The specialist Canon and Nikon astrophotography models do not work perfectly as all-purpose cameras, as the differences in how they capture infrared light interferes with photography in the daylight. For the vast majority of people it would make sense to get the best all-round DLSR or mirrorless camera for their budget. Yes, there are companies that can convert regular cameras to be optimized for astrophotography, for instance, Life Pixel. If you have a standard DSLR or mirrorless camera you can replace the low pass filter replaced with one that allows H-Alpha emissions, or you can buy pre-converted camera models. Check out Life Pixel here. DLSR stands for Digital Single-Lens Reflex camera. It is a digital camera that uses a mirror to reflect light from the lens to the optical viewfinder or onto an image sensor. They comprise a main body that can then have a range of different lenses attached. They contrast with ‘point-and-shoot-cameras’ by being capable of attaching different lenses, and by offering more control over the settings, such as shutter speed, aperture, and ISO. These have been the most popular cameras for photographers in the past decade, but mirrorless cameras are growing in popularity. 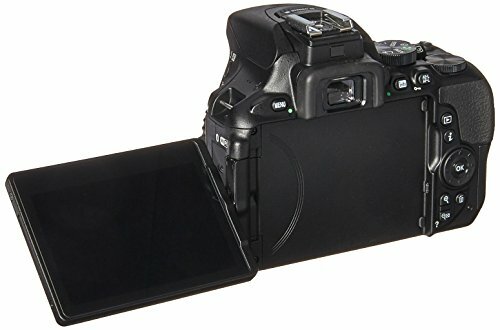 Mirrorless cameras do not have an optical mirror like a DSLR, but instead have an electronic viewfinder which displays what the camera image sensor sees. Like DSLRs, mirrorless cameras can be used with interchangeable lenses. Mirrorless cameras are becoming more popular with photographers and 2018 saw the two main camera manufacturers – Nikon and Canon – release mirrorless models that could compete with Sony, the current market leader in mirrorless cameras. Mirrorless cameras tend to be smaller and lighter than DSLRs and the digital display gives a more accurate image preview in the viewfinder. DSLRs tend to have better autofocus capabilities, better battery life, and work with a larger range of lenses. DSLRs remain the most popular choice for photographers, but mirrorless cameras are catching up as the technology advances and brings the cost down of the equipment. A common school of thought is that mirrorless cameras will eventually replace DSLRs as the default camera choice at some point in the future. The cameras above are all high-end, high-performance cameras capable of delivering excellent results for astrophotography and if you are looking to make a serious investment in this area then you can’t go wrong with these. It is of course more than possible to get great results with mid-range or budget DSLRs and the high-end models considered here have prices that reflect that they are for serious enthusiasts. None of the downsides of any of the above models are reasons to steer clear of them and ultimately which model you might go for will depend on a number of factors. If you are a Nikon user then you may well favor the Nikon D850 – widely regarded as the best all-round camera on the market right now and was brand new in 2017. If you are a Canon user then you can’t really go wrong with the Canon EOS 5D Mark IV. It’s a brilliant all-round camera. Entry-level and mid-range Canon DSLRs tend to perform strongly for astrophotography and so you might want to explore this. There is a model to avoid though – the Canon 1100D – as it has a defect which leaves black lines under bright stars at long exposure. If you are looking to invest in something different and are not already in the Nikon or Canon camps then the Sony A7R iii may be a good option for you as a versatile camera capable of producing amazing pictures of all kinds. Many believe that the future of photography will be mirrorless over DSLR and if you agree this might be the right camera for you. Be sure to also check out the best lens for astrophotography to help ensure you make the most of your camera for shooting the stars. Note: some of the links on this page are affiliate links. This means that if you buy a product after clicking these links then we earn a commission at no additional cost to you. This helps maintain Skies & Scopes and we are grateful for your support. This article was originally posted on 17 July 2017 and has been updated for 2019. Hi Nicholas, thanks for pointing this out. It is indeed a relevant issue and is still not resolved. We have updated the article now to cover this and will continue to monitor to see if Sony resolve the situation. Just to note for readers – the ‘star eater’ problem for Sony cameras has been resolved in 2018! My suggestion for the least expensive and most versatile astrophotography camera: If you have an older Nikon D3000 or D5000 series, send it to Lifepixel.com and have the low pass filter replaced with one that allows Halpha emissions, so the longer wavelengths in the red part of the spectrum, through. Then get a new model for every day photography. The difference between low pass and Halpha permeable filter is stunning. Sensitivity in the red emission nebula spectral range increases by 5-fold. There is no need to have a very complex and feature rich camera body for astrophotography. Essentially all you need is a camera body to which you can connect a remote release that keeps the shutter open for minutes at a time. Autofocus, program automatic, all that is irrelevant. A chip that gives reasonably low noise at 1600 ISO is all that is required. Thanks Jose! Great tip with Life Pixel. A glaring omission in your review is mention of the Pentax K-1 – arguably the best camera for night photography on the market. Thanks John! We’ll consider adding the camera on the next review and update of the article.